Jason Scherer Makes History as the First Back to Back King! Jason Scherer Makes History As The First Back To Back King. February 10, 2019 (Hammertown, CA)- They say that nice guys finish last, but Jason Scherer flew in the face of that cliché by making history as the first back-to-back winner of the Nitto King of the Hammers powered by Optima Batteries (KOH) and taking his third crown. Friendly and articulate, Scherer is a successful business owner who has been off-roading his entire life. He first won King of the Hammers in 2009, when the event was in its infancy. For the next decade he tried to build a better mousetrap and find the formula to repeat that early success. Well, he found it. A week of racing in Johnson Valley in front of 50,000 rabid fans and 2,000,000 online viewers culminated with Friday’s Nitto King of the Hammers powered by Optima Batteries. Covering 235 miles of punishing desert terrain and some of the most difficult rockcrawling trails in the world (aka The Hammers), KOH has a reputation as being one of the most difficult races on earth, pushing man and machine to their breaking point, and beyond. Attrition was as high as ever, with only 29 of the 111 competitors reaching the finish line within the 14-hour time limit. Jason Scherer is a perennially fast qualifier, starting on the front row at KOH for the last six years in a row. This year he qualified second behind Nick Nelson. Like Mitch Guthrie Jr. in the Can-Am King of the Hammers UTV Race presented by HCR and Casey Gilbert in the 4WP Every Man Challenge, Scherer leveraged that clean air to stay ahead of the field and avoid traffic jams in notoriously difficult trails like Jack North and Full of Hate. And like Guthrie and Gilbert, Scherer’s combination of preparation, vehicle prowess, team support, and raw driving talent combined to allow him to win the 4400 race for the second year in a row. None of this is to suggest that Scherer’s victory came easy in the six hours and 32 minutes it took him to complete the race. “It was pretty busy from the first corner all the way through the desert,” Scherer noted at the finish line. “It was everything you could ask for from the pressure from the other drivers, to the obstacles, to how awesome the car ran. You can’t imagine how awesome it is when everything works together.” Several drivers contested for the lead early in the race, but Scherer had a near perfect day to beat Erik Miller by five minutes. Miller, a two-time king greeted his team, wife, and one-month old baby boy at the finish line. “I’m really proud of this sport, with the amount of people who are here (in Hammertown). I’ve never seen more international fans, or people here camping. It’s an absolute zoo,” Erik stated after the race. As the 2019 Nitto King of the Hammers 10 p.m. cutoff time closed in, it was clear once again that just to cross the finish line is a respected achievement in the toughest one day off-road race. 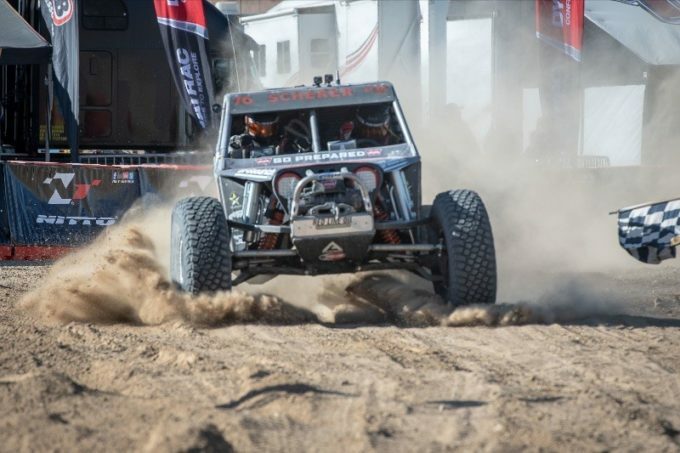 The Nitto King of the Hammers powered by Optima Batteries kicks off the Ultra4 season, which consists of three series (East, West, and North) with multiple races per series. The next race is the Ultra4 Stampede on March 22nd near Sacramento, California. Learn more at www.ultra4racing.com. 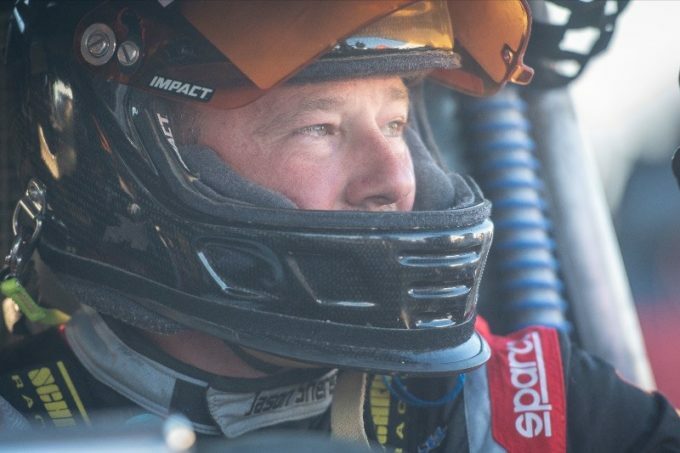 Jason Scherer wins the 2019 Nitto King of the Hammers Powered by Optima Batteries.